Television presenter Chris Packham revealed he views himself as an ‘umbrella’ as he evoked the spirit of the Kinder Scout mass trespassers for his environmental campaigns. The naturalist said he is working with Green MP Caroline Lucas to bring together various groups to push for a greater say in outdoors matters. He was speaking at the meeting of the Outdoor Writers and Photographers Guild, where he received the organisation’s Golden Eagle award for distinguished services to the outdoors. He told the meeting his work with the Brighton MP had the aim of creating strategic alliances across the environmental sector. The pair hope to bring NGOs together so that they act in a more unified way, he said. 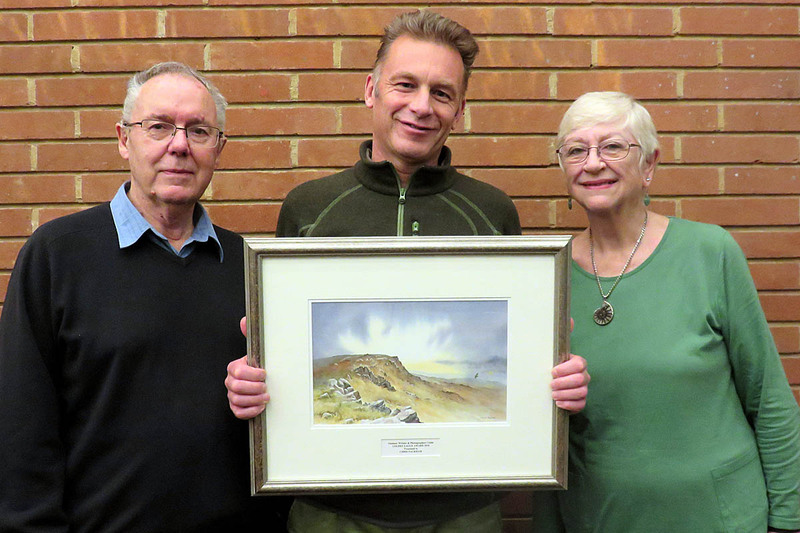 Guild chair Peter Gillman and his wife Leni, the group’s meetings secretary, made the presentation to the presenter at Kensington Town Hall, where Mr Packham was hosting an evening devoted to wildlife travel and photography with Paul Goldstein of Exodus Travel. The 57-year-old Springwatch presenter championed causes such as opposing badger culling, foxhunting, driven grouse shooting, the slaughter of migrating birds on Malta and the illegal persecution of raptors. The guild said he has done so in the face of powerful opposition and has been courageous in using his own high public profile to take a stand on a range of vital issues. The award consisted of an original water colour painting by guild member David Bellamy of Clougha Pike in the Forest of Bowland, with a hen harrier gliding below the summit to highlight Mr Packham’s work combatting the illegal persecution and killing of birds of prey. He said he was ‘flattered and honoured’ to receive the award.